Dusseldorf's Deathrow was part of the second-wave of German thrash metal bands which followed hot on the heels of Kreator, Destruction and Sodom. Signed by Noise records in 1986 who were suitably impressed when Kreator passed on their demo they recorded their album debut Riders of Doom in the same year. It was an okay yet choppy affair, which lacked a decent production and had way too much Metallica for its own good. 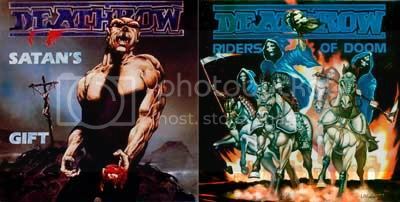 Despite this, and my non-recommendation Riders ... received rave reviews and Deathrow (who were once called Samhain) was the darlings of the metal press for a period of time. Indeed, despite song titles such as Satan's Gift, Dark Tales and Hell's Ascent Deathrow was by no means affiliated with Satanism or black metal. One just had to take a look at the back of the album at the four scruffy metal heads posing in a scrap yard to see this. Quorthon had nothing to fear. 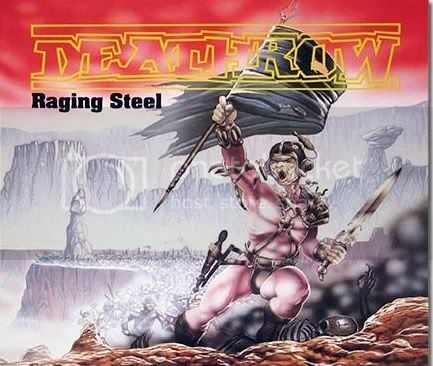 Roll on 1987 and Deathrow returned with studio album # 2, Raging Steel (featuring a non-satanic album cover). As in most cases with bands of that era, a year made a hell of a difference and RS sounds nothing like its predecessor. In fact, Raging ... is a superior album all round, from its thick, warm production to mature song arrangements that Riders ... only hinted at. Deathrow was firing on all cylinders on this album, and part of that was due to the helpful hand of producer Harris Johns. The man was prolific, producing some of the greatest thrash albums of the mid-late eighties. Some unfairly criticised him and Music-Lab studios in Berlin as a conveyer belt-like factory, churning out albums like Scott Burns and Morrisound in Florida would do a few years later. However, unlike today where one can easily build a portable studio/record an album in your bedroom back in the day thrash was limited where it could be recorded, and Music-Lab was a studio guaranteed to give results, and professional results at that. With Deathrow using Johns for Raging Steel (Ralph Hubert & Andre Chipalier produced Riders...) they released an album that ticked all of the thrash-o-meter boxes, and then some. 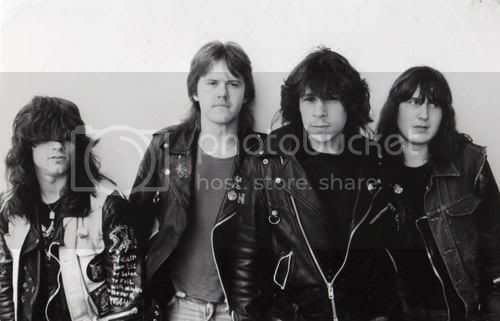 The band, guitarists Thomas Priebe and Sven Flugge, drummer Markus Hahn and bassist/vocalist Milo seemingly lived on a diet of Accept, Maiden and Slayer when they recorded Raging. Though not as fast as some their thrash metal peers, they certainly could stomp along with the best of them; just listen to the opening track and album title blasting forth after the innocuous intro, The Dawn. The comparison to Riders ... is immediate and striking, Raging Steel's production thick, warm and fuzzy, unlike the clanky mess of the debut. These songs are tasty, pure and infectious; melodic, fast, well-crafted and played, and while not as vicious as early Kreator or as polished as Seven Keys-era Helloween Deathrow honed the balance between the two, producing a riotous album of delicious, hum-able tunes. Pledge to Die is fantastic, a truly thrash-tastic stomper, while The Thing Within begins with an acoustic intro that leads to a collage of time changes galore that eventually leads into the main riff an backbone of the song. Mortal Dread has an eerie feel about it before launching itself unashamedly into the mosh pit, and The Undead Cry, an instrumental, shows off the band's skills as brilliant musicians. Beyond the Light, which clocks in at an impressive six minutes twenty four seconds is notable for its stop-start brashness, and would go on to set the tone for album # 3, the complicated Deception Ignored. Lyrically, the band touched on a variety of subjects. Scattered by the Wind (this was supposed to be the album title) broached the tricky subject of the Holocaust (Deathrow are German, after all); A new kind of killing had to be created/A giant machinery of death/The final solution, the holocaust/The concentration camps. The almost Power Metal Dragon's Blood dazzled us with tales of wizards and warlocks (casting their spells), and Pledge to Die tackles the subject of the Crusades - Follow the holy call and defend/Your land against infidels and martyrs (the more things change ...) Deathrow obviously wanted no confusion this time round regarding the misinterpretation of the band or the band's image. Consequently, the album cover, painted by Noise favourite Phil Lawvere featured a cartoonish, sci-fi depiction of a futuristic warrior leading a vast army into battle across a rocky plain. No horned one disembowelling unfortunates here, but according to Flugge in an interview with VoicesFromtheDarkside.com this wasn't the first choice of the band's, either. Whilst not in the same league as Pleasure to Kill, Darkness Descends, Bonded by Blood or Hell Awaits, Raging Steel is a classic thrash metal album for the simple reason that it's a bloody great thrash metal album. Fast, technically competent, well-played with memorable tunes and a throbbing production, Deathrow never sounded as vibrant as they do here. It remains a favourite of mine to this day. (1) Ironically, the recent CD re-releases on Displeased Records features the Satan's Gift artwork as the main cover. The Rider's of Doom album cover appears on the back of the booklet, and the disc itself has the SG art, too.